Alive In Africa: My trip to Village...A recap! Hello my friends, I am sorry that it has taken so long to recap the trip. We didn’t have any cell service the second half of the trip and then we have been hitting the ground running preparing for a day long ministry meeting. So, I included a few pictures and a recap by Luke with some contributions by myself. Overall it was an amazing trip, and I think that though the recap is long, it is worth reading. I hope to follow this blog post (internet willing) with a highlight video that I have put together… Thanks again for all your prayers! This correspondence is being written on the heels of what has been three and a half days of amazing ministry in the rural areas of Zambia’s Southern Province. 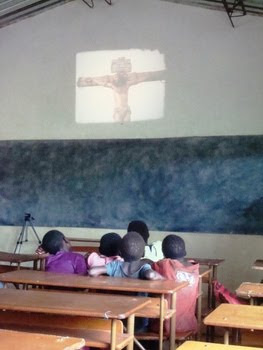 A team of five men (three local pastors and two AZ missionaries) from Action Zambia spent the past few days showing the Jesus Film in partnership with Campus Crusade for Christ Zambia in the remote areas of Chikankhata (chi-kan-kata). The mission trip was also made possible through the permission and invitation of the local leader Chieftainess who rules over the roughly 98,000 Tongas that live in her chiefdom of Chikankhata. Her Royal Highness had told us that she believed many of the people who would be seeing the film would be hearing the detailed story of Jesus Christ for the first time. She assumed that many had heard of Jesus before but the majority of her people had no understanding that salvation through Jesus Christ was personally available to them. How right she was. The Action Zambia team consisted of three local pastors who are currently involved with Action Zambia Pastoral Leadership Development ministry. Local pastors Anderson Jere, Patson Sakala, Bryan Zulu and Action Zambia missionaries Steve Allen and Luke Whitfield were accompanied by Campus Crusade for Christ Zambia volunteer Paul Mulenga who was an integral part of the team assuring that all the technical aspects of showing the film were taken care of. The group arrived in the village of Chikankhata on December 3rd and enjoyed a meal and time of fellowship with the Chieftainess and her family. She detailed the following day’s event and informed the team that they would be traveling to a nearby village called Ngangula where she was born. Upon arriving in Ngangula mid morning on December 4th the convoy, which was lead by the Chieftainess herself, was greeted by a group of women dressed alike and performing the traditional dance which is always performed when welcoming a visiting Chief. The team set up the film in a local Salvation Army Church which could have been no bigger than (20’ x 30’) and began to use the loud speakers to alert those in the outlaying areas of the event. In all there were probably around 200 people who turned out to view the film in their local language. The film runs for around two hours and it was amazing to see people continuously coming out of the surround bush even as the film was concluding. Afterwards the team directed the viewers to a local soccer field and gave an opportunity for those who wanted to receive Christ to do so as well as receive prayers for sickness, demonic possession, or simply peace from a life consumed by fear. As the team prayed for the locals a huge thunderstorm developed all around the field but the crowd was never rained upon. The local people received a front row seat as God displayed His power during the prayer time through a continuous lightning show in the near distance. The team prayed for many to receive Christ as well as praying for the sick and oppressed. The two highlights though was the opportunity to pray for a little boy on crutches who came through the crowd, as one team member commented, “Just like the crippled man in the Bible”. 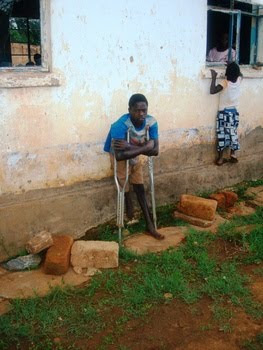 The boy had a severely deformed right leg that was significantly shorter than his left one and although there was no visible evidence of an immediate healing the real miracle was to watch the faces of those in the crowd as team members focus so much love and acceptance towards this little guy. Disabled members of society are generally not valued by traditional Zambian culture so for the people to see these “special guests” affirming the “least of them” it spoke volumes to the authenticity of the Gospel the team had just explain. The other was a fourteen year old young woman named Desire who sought forgiveness for the bad things she had done but also expressed a desire to be a doctor. She was orphaned at a young age, and couldn’t even remember her mother or father. She became a Christian and we gave her a new testament to read. We ate a late lunch in the Chieftaness sister’s home, and though we ate at the same time, the Chieftainess was a in a separated partition of the room. Only Luke and Steve’s daughters who accompanied us on this trip were allowed to eat with her, a privilege they relished. They love their “grandma.” That evening we also showed the film in the village of Chikinkata in a large Salvation Army hall. Around 200 mostly young people showed up to watch the film which has been advertised on the local radio. The movie ended at 11:00pm which hindered much follow-up. The following morning (December 5) the team set out for the roughly 20 mile trip to visit the remote area of Simwambwa. This rural community is located in a valley surrounded by hills on all sides and is very isolated from most common forms of modern development. Upon the teams arrival they received a massive rain shower, the first in two weeks, which lasted almost the rest of the evening. The team was informed by the local Head Master of the school that they were “good visitors” because they had brought the rains (when God opens doors He puts out all the bells and whistles!). The team spent a good hour and half reading the Bible and praying for the evening with the Chieftainess. Her passion and love for her people is evident with anyone who listens to her pray. Among one of the greatest encouragements of this trip for the pastors who participated with us was their time with the Chieftainess. Her unabashed love and faithfulness to Jesus and her desire to see her people be free from the darkness is evident in everything she does. That evening the film was shown despite the constant sound of heavy rain on the tin roof above. The turnout was good and the team estimated the first showing had about 75 people in attendance who could not tear their eyes away from what they were watching. The evening also produced what could have been the biggest lesson of the trip as the team witnessed this first group’s response to the invitation to receive Christ at the end of the film. When the invitation was given to pray and receive prayer for sickness and such what had previously been a somewhat full room soon became empty with the exception of a couple brave women. The team watched as those who exited the room crowded around the few windows outside the to watched with great anticipation at what would transpire next. Murmurs and anxious comments could be heard as the bystanders offered their thoughts to one another on the events occurring inside. When the team had a chance to reflect on this phenomenon they agree that what had been witnessed was a people who had never before been presented with a genuine opportunity to enter into a relationship with Christ. The team demonstrated unity in the Spirit as they all confessed that rather than responding in discouragement they would decide to pray that the Holy Spirit would work in the hearts of those who had been fearful and bring them back Sunday morning (December 6th) when the team would show the film again. It had been announced Saturday evening (December 5th) that there would be another showing Sunday morning in Simwambwa at 7:00 AM sharp. Bit by bit people began to emerge from the surrounding villages and by the midpoint of the film the room was almost full. Again, there continued to be a steady and constant flow of people arriving even as the first showing was concluding. 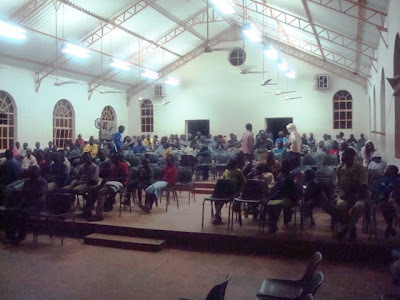 One of the Action Zambia pastors was told that even though the film was ending there was word that people were still coming from the far outlying areas. With this in mind the team decided to have a brief time of explanation of the film which would be followed by another showing to accommodate any who were still on their way. It was truly humbling for the team to witness so many who traveled so far to hear about Christ’s love for them. By the conclusion of the second showing on Sunday the Chieftaness had arrived back from a short trip she needed to take to attend a meeting with Rupiah Banda who is the current President of Zambia. She informed the team later, that she had totally missed the meeting by the time she arrived but that they should not be concerned because to her, the mission of Action Zambia’s trip had great eternal value for her people. With Chieftainess Mwenda in attendance the team once more gave an invitation, with the help of the Chieftainess herself as the interpreter (the team was informed that this is an unheard of honor), for the roughly 150 present to respond to the Gospel of Jesus Christ. The response was uplifting as the crowd was encouraged to stop living under the fear of tradition and witchcraft and chose to receive the everlasting peace that exists in Jesus alone. Many decided to pray to receive Christ as well as receive prayers for sickness and demonic oppression. 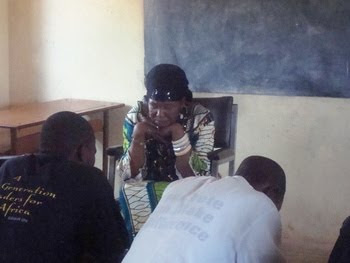 There was even an opportunity to anoint and pray for one of the local Headmen (local government leader) who had been complaining of continuous demonic oppression and attack. Later that afternoon the team was lead by the Chieftainess to the nearby village of Chikani, which although was only 10 miles away took the team almost two hours to reach. Chikani was to be the last location for the team to show the film before departing back to Lusaka. The drive took the team through mountain streams and travelled some of the most rugged road any member of the team had seen in Zambia. Along the way the Chieftainess suddenly stopped the convoy to get out and listen to the trials of one of her tribesmen. This man who name was Robson, described how his grass thatched roof had burned after a lightning strike that also hit his son Emmanuel. He wholeheartedly believed it was the work of a witchdoctor and had stopped the Chieftainess to request her to send for a “witch hunter”. The Chieftainess asked the team to pray for this dear man and his family to be delivered from the fear they daily live with. After listening to the team give witness of God’s love for them the whole family, maybe fourteen in all, joined hands with the team and prayed to receive Christ. As the team arrived in Chikani it was clear, by the group of people already assembled, that word had travelled ahead of them detailing their visit and the showing of the film. The team quickly assembled the equipment and began the viewing. Within a span of around forty minutes the room, which could not have been much bigger than an average American garage, was filled with what seemed to be well over a hundred people. By the conclusion of the film the room was so packed that when Paul Mulenga, the team’s film technician, tried to get back in to monitor the projector the occupants told him to wait and let them finish watching this film. The Chieftainess once again translated as the team shared with a large crowd of people the hope and eternal peace that existing in the name of Jesus. Once more there was a positive response of those wanting to receive Christ into their daily lives and they also clearly requested that Action Zambia return with the film since many more still on their way had not gotten the benefit of viewing it. After packing up the team followed the Chieftainess through another fifteen miles of the remote wilderness that makes up much of her chiefdom. One team member reflected, “all through the valleys we have seen there are hundreds of huts all containing people who need a chance to see what we have just shown others”. What an accurate account of what exists in this vast area that God has given Action Zambia great favor to minister in here in Southern Zambia. Quite possibly one of the greatest highlights was an opportunity that Luke and Steve had to sit down with the Chieftainess and to hear her hopes for her people and her desire that we would partner with her in not only reaching the kingdoms using the Jesus Film, but utilizing our HIV/AIDS team, our Community School teams and our PLD pastors to put on conferences, camps and meetings. She shared which villages we should start with so that we could then begin to reach the truly unreached villages that bordered the area. She shared how her eyes have been opened by the suffering her people are enduring and she welcomed us with a wide open blessing to come and join her in ministering to her kingdom. There is much more to share and praise God about surrounding Action Zambia’s recent exploratory trip to Chikankhata. The team hopes to get a more detailed report of the trips events in the very near future. The Apostle Paul reminds us in II Timothy 4:2: Preach the Word of God. Be prepared, whether the time is favorable or not. Patiently correct, rebuke, and encourage your people with good teaching (NLT). There were many an opportunity to put this verse into practice over the last four days and the team was amazed to see God provide opportunities to glorify and advance His Kingdom when they least expected it. There is no doubt that the spiritual need of the people of Chikankhata is enormous and the work needed to be completed will not be accomplished through a few quick evangelistic trips. To those who prayed consistently for this trip, please know you are the real horsepower that allows the hands and feet of Christ to ministry to the masses as occurred in Chikankhata over the past few days. We are all part of the Body of Christ and each part is essential in the advancement of His kingdom throughout the darkness that suffocates much of the world we live in. Please continue to pray for Action Zambia and the Chieftainess as they continue to seek the Lord’s will in this divinely appointed relationship. I'm glad Kamryn got to go with you, too.